Bundled with Game of the Year edition of Oblivion, along with Knights of the Nine. See the FAQs for more details. Warning: Be sure to install the latest patch to fix a serious bug. A map of the isles. The Elder Scrolls IV: Shivering Isles is the first expansion for Oblivion. The official release date was March 27, 2007; however, the expansion was made available one day early for the Xbox 360 due to routine maintenance scheduled for Xbox Live on the 27th. 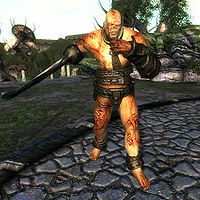 Bethesda has subsequently released Shivering Isles in various other formats, including a PS3 version and in a package with the GOTY edition of Oblivion. The expansion revolves around the Daedric Prince of Madness, Sheogorath, and is set in the Shivering Isles - the exotic and strange landmass located in his plane of Oblivion. The Isles are roughly a quarter of Cyrodiil's size, and are full of many new creatures, items, alchemical ingredients, and quests. Over 9,500 new lines of dialogue have been recorded for the multitudes of new NPCs. There are also ten new Achievements (worth 250 points in total) to be awarded on the Xbox 360 version. The lands are divided into two halves: northern Mania and southern Dementia. Mania is a land full of slightly over-saturated colors and fanciful flora, whereas Dementia is a much darker, somber realm containing foreboding architecture and gloomy skies. There are over a dozen new creatures to fight in both realms, including hideous insects, Flesh Atronachs, skeletal Shambles, amphibious Grummites, Gatekeepers, Golden Saints, Knights of Order, Gnarls and many more. The main quest involves Sheogorath himself, who seeks a champion to save his realm. He claims that at the end of an era, his lands are destroyed by an otherworldly force known as the "Greymarch"... and the current era is almost over. The gateway of Madness, appearing on the new island in Niben Bay. 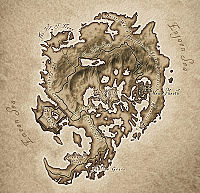 Initially, installing the Shivering Isles will make no change to Cyrodiil. However, after resting for 24 hours, the game informs the player via a quest update that a mysterious isle has arisen in the Niben Bay. On this island sits an unusual gate, in the shape of a conglomerate of faces joined at the eyes. 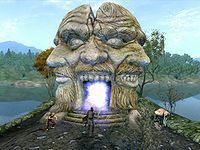 The open mouth of one of the faces contains a portal to the Isles; however, the player is not immediately free to explore the lands. The portal takes the player to a small chamber - inside is Haskill, Sheogorath's chamberlain. He informs the player of Sheogorath's dilemma and transports the player to a region called The Fringe. The Gatekeeper: a gigantic, unnerving collection of body parts whose demise is your only ticket to exploring the Isles. The Fringe is a large, walled section in the western areas of the Isles, on the coast of the Emean Sea. The player, however, is still not free to explore the Isles at this point, because the only way out is to defeat a gargantuan beast known as the Gatekeeper, located to the east of the town of Passwall, and open the gates to the Isles proper. New Sheoth is the capital city of the Shivering Isles, and is divided into three districts. Crucible - Located on the south side of town, in Dementia. This murky area of town has a lot of rundown houses. Bliss - A bright and cheery place, in Mania, most of whose residents are utterly insane. New Sheoth Palace - Home to Sheogorath and the Houses of Dementia and Mania. In both Crucible and Bliss, you can find blacksmiths who will forge armor and weapons. The Crucible blacksmith specializes in heavy armor, made from Madness Ore. The Bliss blacksmith specializes in light armor, made from Amber. Crafting items requires anywhere from one to five pieces of Amber or Madness Ore. The item can be made even more potent with the use of Matrix Stones, which augment crafted equipment with various powers and effects. There are specific Matrix Stones for light and heavy armor, as well as for individual pieces of armor. The Museum of Oddities is found in Crucible. The museum is mostly empty, and it is up to the player to fill its treasure chests with various items. 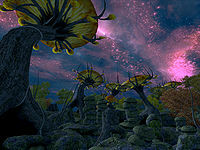 The twisted, exotic flora and skies of the Shivering Isles provide a stark contrast to the outdoors of Tamriel. The central questline offers around 30 more hours of game play, with quest lines that branch more than they did in Oblivion. You will face Sheogorath's trials and explore the extremes of his insanity, both creative and psychotic. At one point, you are given the choice to become the ruler of either Dementia or Mania. The official site asks: "Do you have the strength to...wear the mantle of a God?" - offering a hint in regards to the final stage of the questline. CVG's articles 1, 2, and 3. IGN: "The Elder Scrolls IV: The Shivering Isles Hands-On"
This page was last modified on 20 May 2018, at 19:25.